"IT'S COMING OUT OF MY BUM!!" Irrepressible blue cat Looshkin has just scoffed a big wedge of King Mouse's most prized possession, Firecracker Cheese, offered in truce with humble sincerity and a great big rocket with a fizzing fuse stuffed inside. Now he's achieved lift-off, blasting round the mice's tunnels behind the family skirting board. There are a couple of pink-and-purple lightning bolts emanating from Looshkin's noggin suggesting some degree of alarm but - really? - he's relishing it! The role of any decent pull quote is to evoke the distilled essence of what lies within. 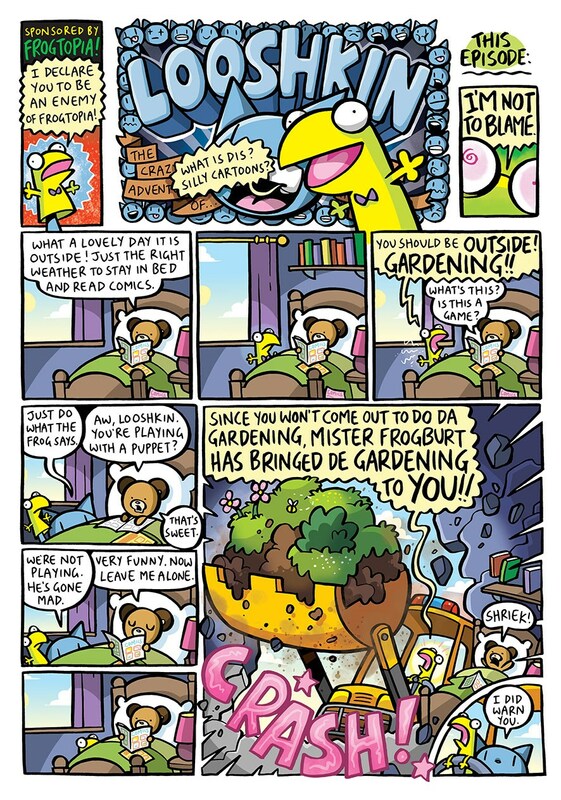 Sometimes it's possible to peel back the complex layers of a carefully crafted collection of comics and also strike at its sophisticated thematic core. So let's hear that again. 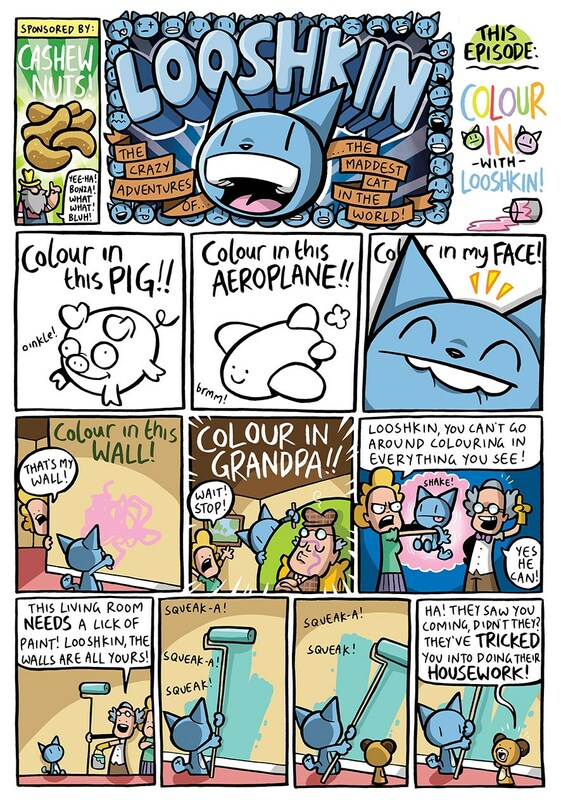 Jamie Smart - the creator of FISH HEAD STEVE and four BUNNY VS MONKEY books whose full-colour bombast you can revel in alongside the other all-ages excellence in Page 45' PHOENIX COMICS collection section - knows exactly what makes kids gurgle with over-excitable, uncontainable, mad-screaming glee and that's this: fart jokes, toilet references, appalling misbehaviour, unbridled chaos and the most massive collateral damage while raging round a home shouting stupid strings of silly-sounding syllables! The timing - both verbal and visual - is neither random nor irrelevant to the comedy. It may be instinctive to Smart, but a simple string of words isn't enough for the anarchy to hit home with maximum skillet-smacking impact. 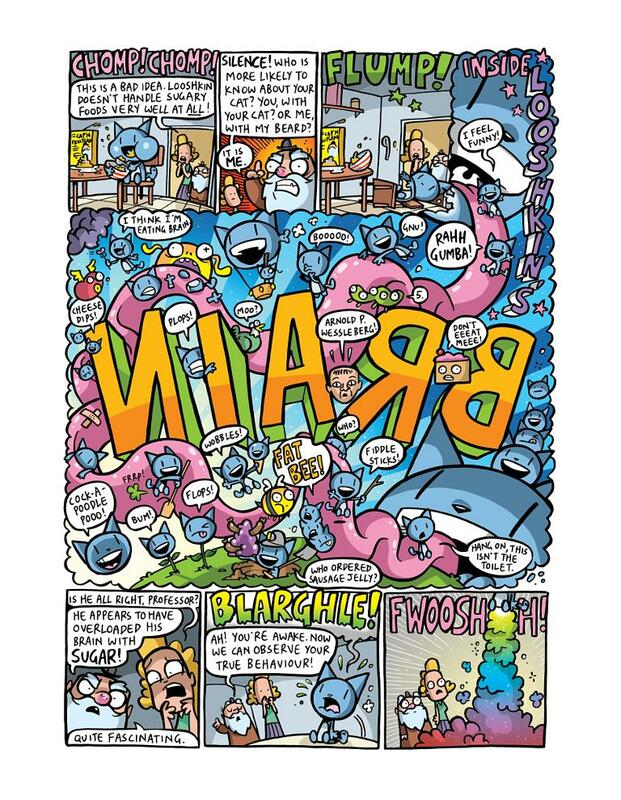 In the last two panels there, Looshkin launches himself back over the arch of a green settee to position himself behind a beleaguered Bear whose default setting throughout these 64 pages is wailing, wide-mouthed terror. "Ah, Great (rich) Auntie Frank! I'm so glad you could come around for a morning coffee!" "Hmph! I HEAR you have recently purchased a CAT." "Well, nothing. You keep it away from us. My prize-winning poodle PRINCESS TRIXIBELL has a very delicate constitution. The slightest fright, and her fur begins to fall out." "Uh. Oh..." murmurs Mum in a tiny inset panel to herself. Uh-oh indeed. Prize-winning, pampered poodle Princess Trixibell is presented to the readers on a gold-tasselled burgundy velvet cushion, a shivering and shaking big bag of nerves. Even though nothing has happened yet, it is almost impossible not to start laughing immediately at the oh-so inevitable which Jamie is, of course, smart enough to leave well alone for three more pages because a) anticipation is everything b) instead of dropping a single water balloon on a UKIP member's head, it is much, much funnier to build up a supply of two dozen water balloons, fill them to bursting point (preferably from a toilet), then carry them five storeys further up before launching the entire barrage down at once. And that is precisely what Jamie does, upstairs, where the kids and cat have supposedly been locked up safely. My analogy wasn't random, either: it will involve water - toilet water, obviously - and squirrels. Key to all this is Looshkin's insatiable appetite for everything: he cannot help himself and will not be stopped. In his determination to catch a bumblebee in a jam jar to steer it safely out of the window, he fails to notice his own success when the bee buzzes out of the window of its own accord, so he carries on pursuing it right up onto the rooftop because he hasn't caught it yet! "Ding Dong! Delivery! Here's that baby shark you ordered." He's holding it, out of water, in his bare hands. "Looshkin, did you order a SHARK?" "It's NOT a shark! It's an OTTER!" 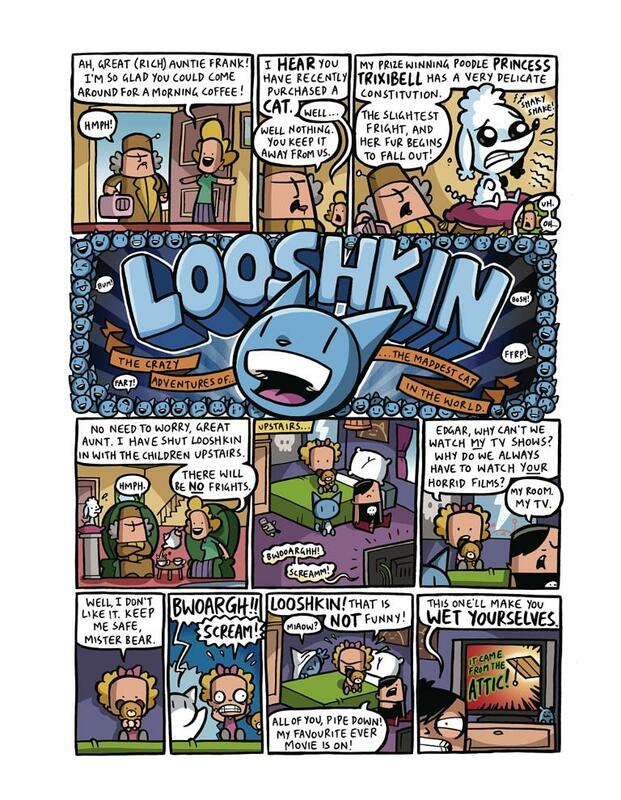 Is it that Looshkin believes he can change the truth by sheer force of will? "You'd better not be running through my house with a shark!" "Whatever you think it is, what on earth are you planning to do with it?" "All the things that otters are known to love doing!" 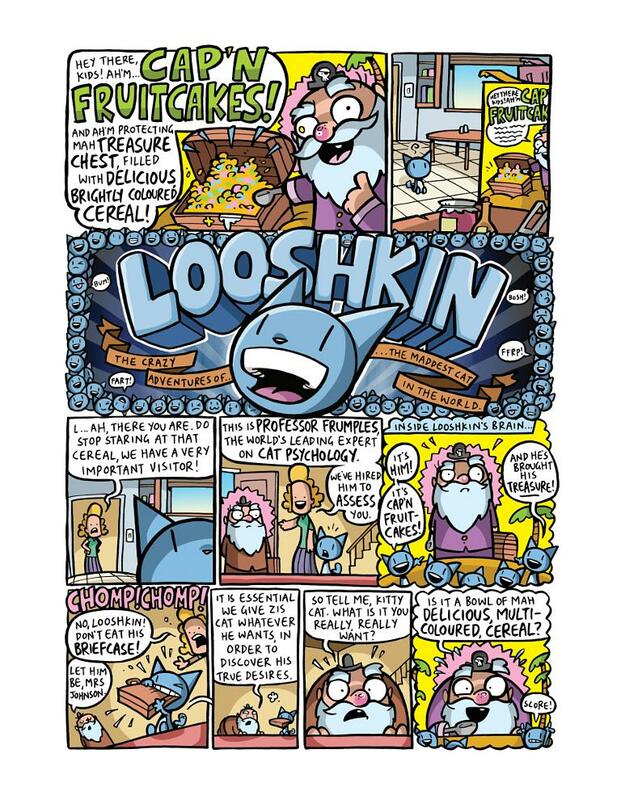 The genius of what follows is that neither a shark nor an otter are known to love dodgems, thick, creamy milkshakes or dressing up like Santa Claus half as much as Looshkin does. He looks particular fine in full Father Christmas ensemble and a winter-white beard. "Hey! You can't argue with nature!" 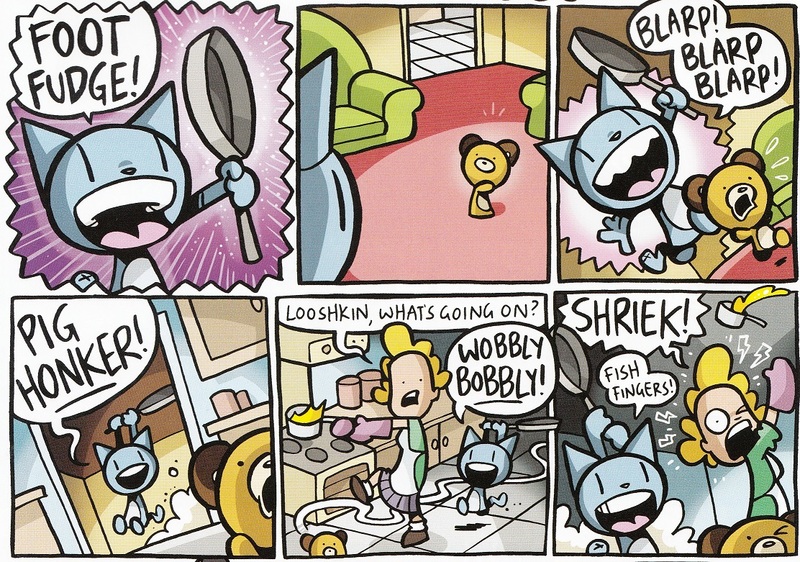 "Did Looshkin get a SHARK?" "OTT-TTER. You're all going to give him identity issues." 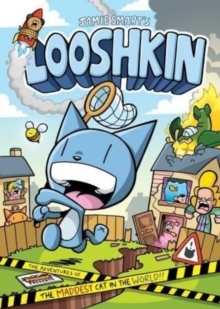 Looshkin is the ultimate child running wild, craving action, attention, adventure, brand-new experiences (preferably dangerous), unorthodox experiments ("We can do a science!") and, above all, delicious, brightly coloured, sugar-coated cereal. What the family craves is peace and quiet; failing that, they'd quite like to comprehend their new cat so they call for an expert, Professor Lionel F. Frumples who has written himself a résumé. "Zat is right, I'm an expert at cats. "I am brilliant at cats. BRILLIANT at zem. "I understand everything about cats. If you told me you were a cat, I'd INSTANTLY know you were lying. I don't recognise your scent. Get out of my office." "This is a bad idea. 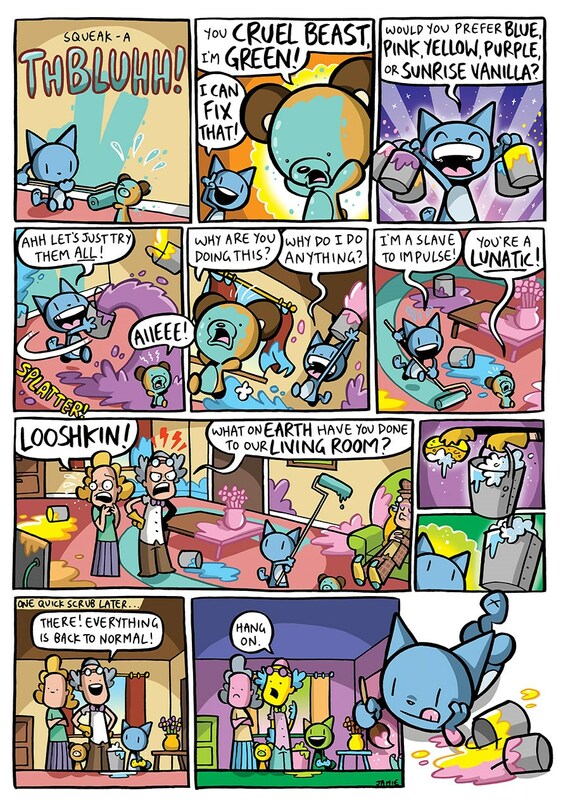 Looshkin doesn't handle sugar very well at all!" "SILENCE! Who is more likely to know about your cat? You, with your cat? Or me, with my beard?" He holds up one finger with authority. I liked the extra anti-deflation device at THE ENNNNDDD.